The Me 410, a high altitude fighter/bomber with two DB 603A engines (1750 hp), wing edge slats, a pressurized cabin, lengthened engine nacelles and no sweep back on the wings. The Me 410 was wanted everywhere on all fronts but by 1943 had arrived too late. When it finally arrived, it was usually limited to the role of high-speed bomber or reconnaissance. The first prototype V1 was ready by the end of 1942. The entire test program evolved some twenty-test planes many of which were modified Me 210s. 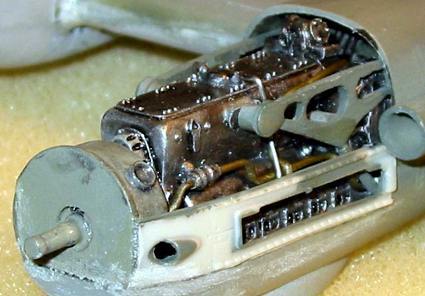 The armament was the same as in the Me 210. A variety of Me410 series aircraft were produced and these included the following versions: The A-1/U was equipped for Photo recon, A-1/U-2 was fitted for the Zerstorer role having a WB151A installed in the bomb bay and the A-1/U-4 had a BH50mm canon beneath the fuselage. 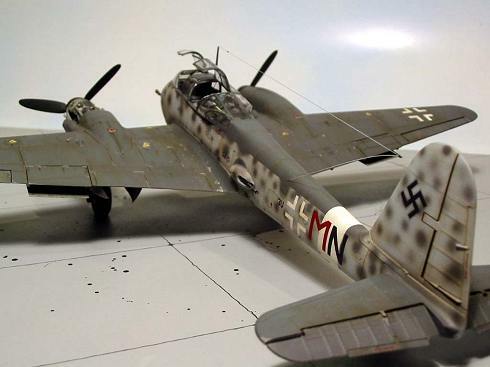 I chose to model the Me410 B-2 / U-4 with the BK 5 50mm cannon. My wife is always saying that I can't build a model “out of the box” well I am here to prove her wrong, this model was total built OOB. The Kit came from a Revel box, the engine from a CMK box, the cockpit from a Aires box and a lot of other parts came from my parts box. So there you go, completely OOB ! The Revell kit is nicely molded in standard grey on three sprues individually bagged. All the surface detail is exceptionally well done having crisp recessed panels. There was a lot of flash on my kit but the cleanup was necessary. The Aires cockpit kit is a typically wonderful Aires offering and really takes your breath away at how much resin they can stuff into a small box, included is photo etch for the instrument panel and various additional parts. The CMK engine set also includes the full wheel well if you chose to open up the gear doors as I did. More on this later. First up was the cockpit. The Aires instructions are not great but with a bit of time is all comes together nice. Some of the interior details of the kits sidewalls need to be removed for the cockpit to fit in, I also found the once the whole cockpit tube was built it made for a nightmare to get it to fit into the fuselage. The way around this was to build the front and rear independently and insert them as separate units then join the top canopy rails for finish it off. There is a lot of resin in the cockpit and with the canopy on the 410 it allows for a great view of the whole cabin. The photo etch seatbelts provided finished it off nicely. The whole cockpit was painted RLM 66, given 2 washes and dry brushed with light grey, finishing off with some color to bring it to life. At this point I cut out the kits wheel bay and prepared to insert the resin replacements, this procedure went well except that I cut a bit too much and had to work at filling with styrene thanks to my clumsiness. The final wheel bay was painted RLM 02 and weathered accordingly. The engine is a beautiful rendition of the DB 603 but is actually a bit large for the nacelle. You will need to carve the bottom of the nacelle a lot to get the engine to slide in, I found that I also needed to shave a bit off the back of the supercharger and re-attach to the engine to get it to fit. A big problem I had here was getting the firewall to fit, after a few nights of messing with it I finally got it to fit and after installing the engine found that it was barely visible, not sure it was worth the effort but I know its there. The actual build of the basic kit went smoothly with two exceptions. 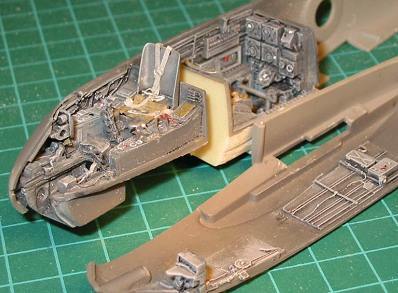 First the bottom of the fuselage needed a lot of putty and work to get it to look right. The other major, MAJOR FUBAR is the canopy. This just did not fit at all, I mean not even close. Be very very careful at the junction on the top of the canopies. I actually inserted a styrene shim to make the canopy fit so take time in this part and you will be alright. The remainder of the kit went together as per instructions; I cut the elevators and relaxed them a bit for effect. On to the paint booth. The aircraft depicted is from 5/ZG26, the paint is a very simple RLM 74,75,76 scheme and the decals are from the kit. The whole aircraft was painted then coated with future. At this point a raw umber wash of oil paint thinned with Turp was applied and left to dry. The next day a turp dampened makeup sponge took away the excess wash leaving the panel lines highlighted. After another coat of future I applied the exhaust markings with the airbrush and dry brushed SNJ polishing powder to get the chipped paint and wear marks I was looking for. Some stretched spur for the antennas and a flat coat and she was done. This was a very challenging and fulfilling project that took along time to complete but I proved to the wife that I could build OOB. I estimate that well over 150 hours went into this project and at times I wondered if I would ever get it finished. The final project holds a proud place in my model cabinet.